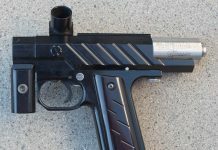 This Micromag likely originated from one of Francois Louvet's companies and have several differences from PTP's Micromags including standard ball detents. 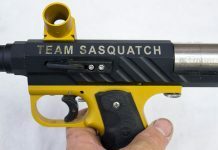 A Team Sasquatch Micromag engraved for co-captain John Law. 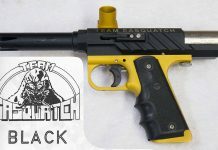 This Micromag was built, engraved, and used in tournaments around 1994-1995. Introduction of the PTP / Gun F/X Micromag? Still searching for information on the PTP Micromag. Most quotes I've found point to 1994 or 1995 but I haven't been able to find any concrete information yet. 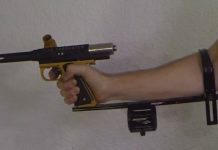 This PTP Micromag, set up with an Arena Arms Speed Stock, belonged to Team Sasquatch Co Captain John Law, aka Lawman.